At the invitation of the Commander of the U.S. Pacific Air Forces, General Robinson, President of the FSM, Peter Christian, joined the aircrew of “Santa 63” on December 13, 2015. The mission was the air delivery of donated Christmas gifts in support of Operation Christmas Drop, 2015. President Christian received an executive preflight briefing from Brigadier General Toth, Commander of the 36th Wing, and his staff at Andersen Air Force Base, Guam. The seven hour mission took off from Guam and conducted multiple low altitude airdrops to several outer island communities in the FSM State of Yap. These islands and atoll’s included: Satawal, Lamotrek, Elato, Faraulep, and Woleiai. 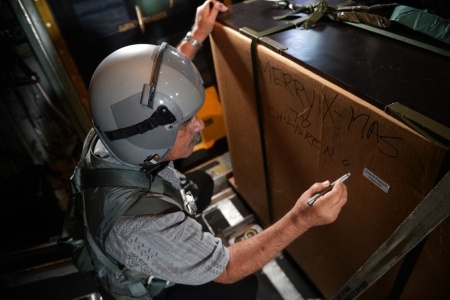 In addition to observing the operation first hand from the cockpit and cargo compartment of the U.S. Air Force Japan based C-130 Hercules, the President also ‘suited up’ and pushed the first two boxes of gift contributions out of the aircraft to the community of Satawal. This marked the first time for an FSM President’s ‘hands-on’ participation in the operation. Operation Christmas Drop is the longest running Humanitarian Assistance mission in the history of the U.S. Department of Defense; reportedly originating with an airdrop mission to the outer island of Kapingamarangi, Pohnpei, in 1952. The annual operation runs for more than a week, and provides holiday gift deliveries throughout the outer islands of Federated States of Micronesia, and the Republic of Palau. Contributions and donations for this mission are an ongoing effort for the entire year leading up to the annual operation. Of note, for the first time in the operation’s history, aircraft and personnel of the Japan Air Self Defense Force and the Royal Australian Air Force joined their U.S. Air Force counterparts in conducting these missions in support of the FSM and Republic of Palau regions. In follow-on correspondence to General Toth, President Christian expressed appreciation for the generosity of all contributors, and for the efforts put forth to plan and successfully execute the operation. He further encouraged that future Humanitarian Assistance operations in this region should continue to maintain the same kind of multilateral and international character of this year’s support operation. Monday, 21 December 2015 - In a swearing-in ceremony in Palikir, Mr. KS Vincent Sivas was sworn in as the Deputy Chief of Mission (DCM) of the Federated States of Micronesia to the Government of the People’s Republic of China. In expressing the significance of the ceremony in the presence of family, staff and cabinet members, President Peter Christian administered the oath of office and indicated his congratulatory remarks to the newly appointed DCM. To ensure the efforts that promote the interests of the FSM, in his responding remarks, DCM Sivas thanked President Christian for the Leaderships trust and confidence to serve in the respective capacity. Prior to serving as First Secretary in Beijing since 2008, DCM Sivas served in various capacities in the Department of Foreign Affairs when he began his career at the FSM National Government in 2003. Present with President Christian were Secretary of the Department of Transportation, Communications & Infrastructure; Lukner Weilbacher, Secretary of Resources and Development; Marion Henry, Deputy Secretary of the Department of Foreign Affairs Samson Pretrick and staff. The Federated States of Micronesia (FSM) Postal Services will implement a postage rate increase, effective on January 17, 2016. During discussions on the issue, FSM Postmaster General (PMG), Mrs. Ginger P. Mida, stated that “the FSM Post Office must either match or exceed any rate increase by the US Postal Service but cannot charge a lower rate,” referring to the language in the current Amended Compact of Free Association with the United States. In accordance with the terms of the Amended Compact, the proposed U.S. Postal Service price increase for 2016 requires the FSM Postal Services to implement a rate increase as well. In addition to the increase rates in services, PMG Mida also noted that Asia Pacific Airlines (APA), the current mail delivery provider, will be publishing a new delivery schedule this month (December). The bulk of the mail delivery service is managed by APA, in part due to United Airlines’ limited cargo carrying capability. The FSM Postal Service is making every effort to maintain timely and responsive mail deliveries; however, it must be noted that unforeseen flight schedule changes and cancellations can impact these efforts. In response to increased mail volume during this holiday season, coordination efforts are underway to ensure that mail delivery services are provided throughout the Christmas Holidays. Appearing before the College of Micronesia (COM) graduating class of 2015, President Peter M. Christian delivered his first college commencement address at COM’s 62nd commencement ceremony on Thursday morning, 17 December 2015. With an introduction by Salutatorian (National campus), Brittny Rose Esguerra, the esteemed keynote speaker, President Christian acknowledged that COM has laid a foundation for the nation’s newest graduates with the given tools to be productive citizens. Each graduate, having the potential to bring something unique to the world, the FSM President congratulated the graduating crowd with words of encouragement to go forward with confidence. Apart of his congratulatory remarks to the graduates having worked hard to reach this milestone, his message resounded with words that invigorated the national soul with a sense of responsibility and honor towards the country and its future. In a moment that marked the beginning of a new chapter for the COM graduating class of 2015, an estimated crowd of more than 300 filled the Main Gym (FSM China Friendship Sports Center) to witness more than 100 COM students receive their respective degrees. The Valedictorians for Class of Fall 2015 were, Ms. Pamela Fredrick for Pohnpei Campus and Mr. Daryll Keller for National Campus. The Fourth France-Oceania Summit was held for the first time in Paris from 25-26 November 2015. The Summit brought together Leaders and Representatives of Pacific Island Forum Countries and Territories to discuss a wide spectrum of issues of mutual interest ranging from Climate Change, Sustainable Development, Oceans, Training, Trade, access to funding, to membership in the regional organizations. The convening of the Summit was significant and timely as it was held on the eve of the Leaders' Event to build political momentum towards the Paris Climate Conference. Climate change has been coined as the greatest challenge of our time and an existential issue for many Pacific Island Countries. There was much expectation for an ambitious Paris Agreement on climate change that will meet the needs of the Pacific people. The Leaders and Representatives of the Pacific Island Forum Countries and Territories adopted a Declaration at the end of the Summit reaffirming the need to strengthen cooperation and improve dialogue. The Declaration can be found on the PIO website. President Peter M. Christian was joined at his first France Oceania Summit by Secretary of Foreign Affairs Lorin Robert, Secretary of Justice Joses Gallen and Ambassador Jane Chigiyal. Kolonia, FSM 29 November 2015— Conservation and Management measures aimed at ensuring a healthy future for the bigeye and skipjack tuna species in Pacific waters are high on the priority list for the Federated States of Micronesia (FSM) delegation to the Pacific’s annual report card meeting on Tuna- the Western and Central Pacific Fisheries Commission (WCPFC). Head of Delegation of the FSM, Executive Director of NORMA Eugene Pangelinan, stated the need to take critical action on effective measures that FSM is prepared to push past decision-making by consensus, also encouraging Commission members to vote on the skipjack issue. The FSM delegation to the 12th Annual Session of the Western and Central Pacific Fisheries Commission, the WCPFC, left Pohnpei on November 21 headed to Bali, Indonesia for a marathon series of technical meetings and negotiations on tuna fisheries. Based on a disappointing outcome for FSM and other Pacific delegates at the 11th WCPFC in Samoa last December, Director Pangelinan had reservations on what can be achieved in the WCPFC 12. Through this important meeting of fisheries policy makers, Director Pangelinan hopes to see the Commission adopt a revised conservation and management measure to reduce juvenile bigeye mortality. “It’s important to adopt new measures for the “uncontrolled and irresponsible” fishing led by long-line operations on the high seas. “Compliance with existing measures has been nothing but a disappointment and is weakening our ability to reach our goal to deliver a sustainable fishery,” he said. Director Pangelinan expects WCPFC12 to be challenged to adopt a Target Reference Point (TRP) for skipjack fisheries, dominated by purse seiners in waters of the Parties to the Nauru Agreement (PNA). “If there is opposition to PNA’s proposal for a TRP on skipjack, then we will push for a vote to get it adopted. It is fundamentally important that this WCPFC12 gets behind the PNA push for this target reference point measure. The skipjack fishery is too important for us to not manage well and if we are to ensure its long-term sustainability, we must start with a TRP in place. Anything less will be irresponsible on our part”. Also important to FSM at the 12th session was the safety of fisheries observers on foreign fishing vessels. “For too long now observers have been threatened, intimidated and mistreated on fishing vessels and this has to stop if these boats want to operate in our waters.” Noting the moves by FSM to improve law enforcement and the safety of observers at sea faced with difficult working environments, he noted the need for the Commission to get behind this issue, “but we will take our own measures and move forward on this. FSM observers are our eyes and ears out there. We must protect them and we will hold flag states responsible for ensuring their welfare and safety”, said Director Pangelinan. The FSM delegation includes NORMA staff Limanman Helgenberger, Chief of Management and Development, and Justino Helgen, Acting Chief of Compliance. In addition, members of Congress, in particular the Chair of the Committee on Resources and Development Hon. David Panuelo, Vice-Chair Hon. Alik Alik, Congressmen Hon. Victor Gouland and Hon. Robson Romolow and staff attorney Alik Jackson are part of the FSM delegation to the 12th WCPFC. The FSM fishing industry will also be present to observe the meetings. The WCPFC headquarters, hosted in Pohnpei, manages the tuna stocks in the Western and Central Pacific Ocean. The PNA, hosted in Majuro, is a group of eight Pacific Island Countries, namely FSM, Palau, Marshall Islands, Papua New Guinea, Nauru, Solomon Islands, Kiribati and Tuvalu, leading the Vessel Day Scheme (VDS), and purse seining activity in their EEZs. The FFA, hosted in Honiara, is the 17-member nation Pacific bloc within the WCPFC, and was established by Forum Leaders in 1978 to strengthen national capacity and regional cooperation in managing the Pacific’s shared resource—tuna. On the morning of November 23, 2015, activity and work sparked the Kosrae port with the revamped transshipment facility being operated by Luen Thai Fishing Venture (LTFV). Chief of Research Mr. Naiten Bradley Phillip Jr. and Port Sampler Mr. Truman Jano from the National Oceanic Resource Management Authority (NORMA) was on hand to monitor and train Kosraen based fisheries observers on port sampling duties. NORMA port sampling monitors the vessels catch and verifies what is unloaded. Secretariat of the Pacific Community (SPC) oceanic division scientist collects the data, to provide analysis of catch reports for NORMA to manage its marine resources effectively to achieve economic-growth for the Nation. This has been the first transshipment in Kosrae after the last operation took place more than ten years ago in the state. A total of 15 long-line vessels with over five hundred tons of catch were scheduled to unload to freezer containers stockpiled in port, ready to take on frozen tuna and other tuna like species. The unloading from frozen long-line operations is a relatively new development in Kosrae that fueled jobs for over 30 Kosrean families contributing additional revenue to the Kosrae businesses and local communities. The state of Kosrae is showing positive results for future transshipment operations with the locally trained staff on site. NORMA Executive Director Pangelinan stated that this is a welcome to restart our long-line operations in FSM ports and Pohnpei and Kosrae are just the beginning. While Luen Thai Fishing Ventures is looking to expand its operations to the states of Chuuk and Yap, the facilities require huge investments which is subject for much discussions among FSM and State Leaders. While NORMA will take steps to ensure proper monitoring measures are in place in Kosrae, other activities in the state includes ship repair that are also part of the Kosrae development program by LTFV.